Trunks's new transformation, also known as "Super Saiyan Rage" has only been achieved by him. Neither Goku, Vegeta or Gohan has achieved it. We don't know much what it's required to acquire this transformation, one of the requirements seems to be being extremely furious, but this doesnt seem to be the only one. Gokú was very furious when in Super Saiyan Blue he was told Chichi and Gotenk were killed in another dimesion, he had an increase in power but he didnt transform into Super Saiyan Rage. Gohan had been many times very furious, particulary the time when he already had acquired the super saiyan 2 level, when Spopovich almost kills Videl, he didnt turn into Super Saiyan Rage. And particulary Vegeta, when he was already a Super Saiyan 2, and Beerus slaps Bulma, he was so furious than when being in Super Saiyan 2 it is said by others (Roshi, Beerus, etc) that he surpassed the power of Goku's super saiyan 3, but he didnt become super saiyan rage. What does this mean then? Can any other saiyan become super saiyan rage? Trunks's first actual super saiyan transformation was when he saw his role model Gohan die after that he got really angry and swore revenge on the androids. A reason Goku cant get super saiyan rage is even though he got mad and transformed into a super saiyan and wanted to avenge Krillin he wasn't as mad as Trunks as you could see Trunks got so mad that his tears were being vaporised off his face. A reason it didn't happen for Vegeta was that he was super Vegeta, a custom super saiyan based more on ki based attacks and super Vegeta can only transform twice so he still wasn't as mad as Trunks. Maybe it's a transformation only half-Saiyans can get. With the exception of Vegeta turning mad against Beerus and reaching a level close to SSJ3 (x4 multiplier), the only Saiyans who seem to get such incredible boost of power with rage are Gohan and Trunks who are half-Saiyans. Gohan, when against Frieza, got a power boost from around 20,000 to close a million to be able to take him down (over x20 for sure). Also, when against Raditz, he just went from the power level of a regular kid to 1,300. Trunks with Super Saiyan Rage went from a level near SSJ2-SSJ3 to the level of a Super Saiyan Blue. 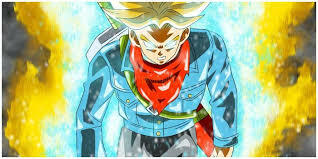 Trunks always had Super Saiyan Rage but he couldn't fully harness its power, not until he absorbed Goku's Genki Dama (spirit bomb) like when Vegeta did the same thing in fusion reborn (I know that it isn't canon but it is to prove a point) and Goku absorbed a Genki Dama in Super Android 13. The point is that when a Super Saiyan absorbs a Genki Dama, their dormant Super Saiyan energy is released. Why is Gohan shown to be so weak in Dragon Ball Super? Does using god ki in base form makes you stronger than turning into super saiyan? Did Vegeta SSJ2 against Beerus surpassed Gohan's mystic form? Is there any official picture of “Ultra Blue” Vegeta? Is Kale stronger than a super saiyan blue in the anime?